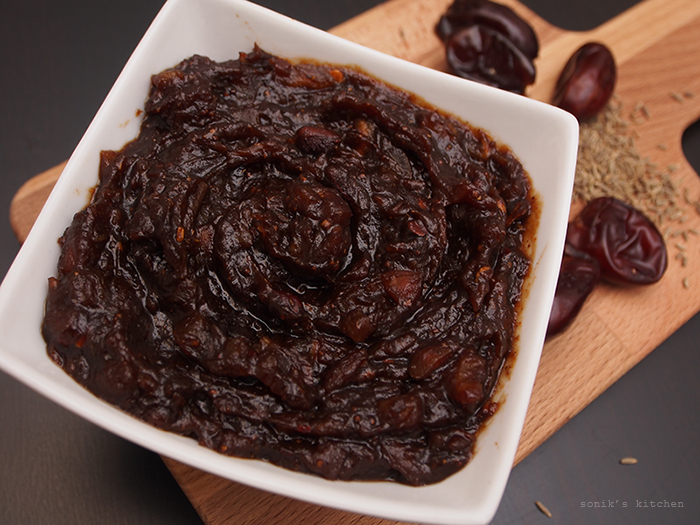 Sweet and sour Date Chutney is a must have dip or stir-in mix for many Indian snacks, especially in making chaats like Bhel Puri, Pani Puri, Samosa etc. The dates compliments the sour taste of tamarind, and I have also added jaggery to increase the sweetness to counter balance the sourness of the tamarind. I just can’t think of the lip smacking street foods you get in India without this particular condiment. It’s got a perfect balance of spicy, tangy and sour flavours. An absolute must have condiment in your kitchen! Wash and stone dates and chop roughly. Dry roast cumin seeds and fennel seeds. Cool slightly and grind to a powder. Mix together dates, jaggery, tamarind pulp, cumin and fennel powder, red chilli powder, dry ginger powder,salt to taste and one cup of water. Cook on medium heat till it comes to a boil, reduce heat and continue to cook for six to eight minutes.